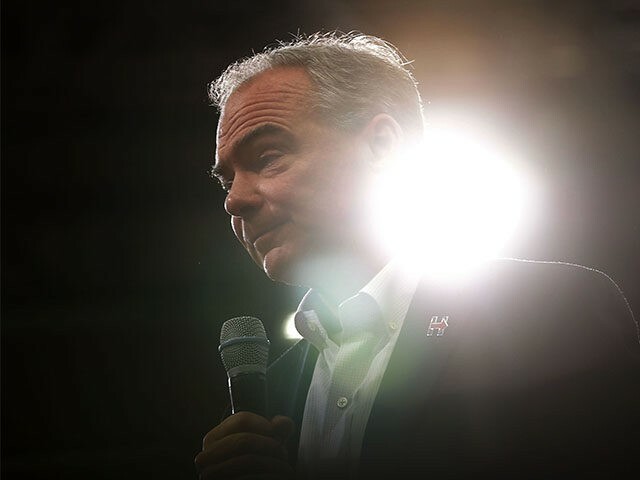 According to Deadline, Kaine spoke for about 15 minutes and then took questions from an audience that included NBCUniversal film chief Jeff Shell, Lionsgate CEO Jon Feltheimer, writer-director Judd Apatow, architect Frank Gehry, CBS Entertainment president Nina Tassler and Cindy Horn. “We’re going to win this. I’m 8-0 in elections and I absolutely plan on being 9-0,” Kaine reportedly told the audience. Tickets for the afternoon fundraiser in Beverly Hills reportedly cost between $2,700 to $27,000. On Monday, Kaine attended a Latinos for Hillary fundraiser at the home of Desperate Housewives star Eva Longoria, with tickets reportedly starting at $10,000 and going all the way up to $100,000. Longoria has long been a Democratic Party contributor, and launched the pro-Democrat Latino Victory Project PAC in 2014. The actress has also compared Republican Donald Trump to Hitler. Sures hosted Kaine for an intimate fundraising dinner at his home in July, before he was chosen as Clinton’s vice presidential running mate. That dinner was attended by about 30 Hollywood heavyweights, including Fox’s Dana Walden, Turner CCO Kevin Reilly and television producer Chuck Lorre. Hillary Clinton was last in Los Angeles in August, when a three-day fundraising swing netted around $18 million for her campaign. The candidate attended fundraisers at the homes of Magic Johnson, Justin Timberlake and Jessica Biel, billionaire entertainment mogul Haim Saban and Apple CEO Time Cook and taped an appearance on ABC’s Jimmy Kimmel Live. Clinton had been scheduled to travel to Los Angeles for another fundraising trip earlier this months, with stops planned at the homes of Family Guy creator Seth MacFarlane and billionaire IAC chairman Barry Biller, but was forced to cancel after being diagnosed with pneumonia.